EDITOR'S NOTE: This article is from the "Redesigning the Industry" series by Automotive News, a sister publication of Automotive News Europe. The series looks at how the industry is being reshaped with the entry of disruptive innovators such as Google's Waymo in autonomous driving, Uber in ride-hailing and Amazon in retailing. It examines how traditional auto companies are responding to the challenges. For the full series, click here. In late August, Toyota announced a blitz of curious investments. It channeled millions of dollars into a clutch of obscure Japanese startups with names such as Giftee, Nightley and Ateam that work on everything from online marketing to cybersecurity. Just what did the Japanese juggernaut see in these relatively unknown tech newcomers? The answer lies in an internal conviction that Toyota has grown too big and ossified to react quickly to the new technologies buffeting the industry. Even Japan's biggest and richest carmaker, the thinking goes, needs smaller, nimbler partners with the expertise it lacks. Convinced that his company's unbridled size is a liability, President Akio Toyoda is leading a change in corporate culture to create a new Toyota with the mindset of the world's biggest little startup. The strategy calls for teaming with a wide array of outside partners, from small-time techy types to big rivals such as Mazda Motor Corp. and BMW. And to speed decision-making and unleash creativity, Toyoda has broken the Japanese parent company into subcompanies empowered to act as self-contained units. The goal is to replicate the streamlined operations of the Silicon Valley startups triggering so much angst. 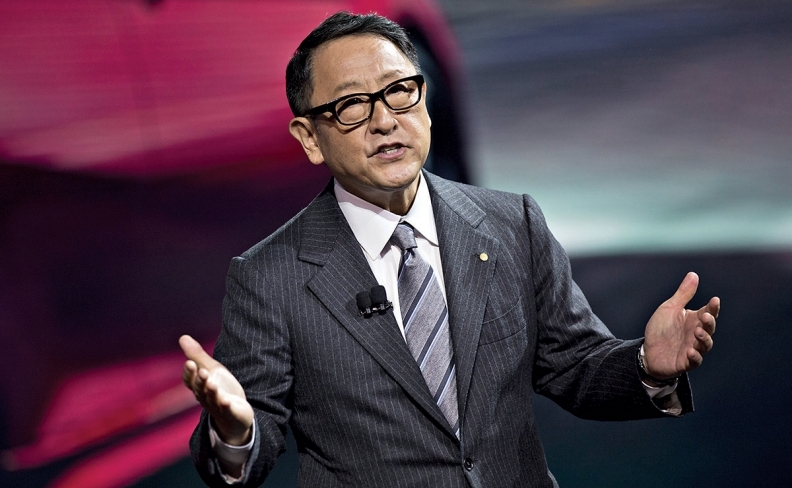 "Toyota has become too big to respond speedily to severe changes in the business environment. This prompted us to start finding ways to overhaul our working practices," Toyoda said while launching the strategy last year. "Rather than being obsessed with doing everything ourselves, we are aiming to enhance competitiveness by reaching out to partners." It represents a sea change for a company with a tradition of doing almost everything itself, thanks to tentaclelike reach into fields as diverse as carmaking, homebuilding and boats. But Toyota's new frontier is artificial intelligence, online services, big data analytics, electrified drivetrains and self-driving systems. Changing times mean changing priorities. "We are trying to use technologies that were not used in automobiles before," Chairman Takeshi Uchiyamada says. "It is a race against time with today's innovation. So, in that sense, we will work with other companies that have their own strengths in certain fields." Hence programs such as Toyota NEXT, which provided the seed money to those promising Japanese startups. That was just one of many high tech tie-ups Toyota brokered this year alone. And the outreach extends to old-school competitors as well. In such arenas as electric vehicles and sports cars, even giant Toyota sees value in partnering. In September, it formed a joint venture to develop an EV architecture with Mazda, and it is soon expected to introduce a new Supra sports car successor created with BMW. Toyota is hardly giving up on its own research into tomorrow's cutting-edge technologies. And it remains to be seen whether juggling a growing network of partnerships is more efficient than centralizing r&d in-house. But Toyota is increasingly cognizant of its limits. "There are a number of new players joining the race," Uchiyamada says. "We don't see them as the enemy. If they have better technology than us, we only need to work with them."